When cells grow and divide, they come into contact with other cells. This happens not only during development and regeneration and after injury, but also during cancer growth and the formation of metastases. When cells come into contact with each other in this way, information is exchanged by proteins, which are embedded in the cell membranes and form tight lock-and-key complexes with each other. These connections must be severed if the cells want to transmit a repulsion signal. It appears that the fastest way to do this is for the cells to engulf the protein complex from the membrane of the neighbouring cell. Scientists from the Max Planck Institute of Neurobiology in Martinsried have now identified the molecules that control this process. Ephrins (blue) and Ephs (red) form complexes (yellow) at cell contact points. To enable the cells to separate from each other, they are pulled into one of the cells with the help of the signalling proteins Tiam and Rac. When cells come into contact with each other, ephrin and Eph receptors are often involved. These proteins are located on the surface of almost all cells. When two cells meet, their ephrin and Eph receptors connect to form tight ephrin/Eph complexes. These complexes then trigger the repulsion process through intracellular signalling pathways. “This is where the problem arises, as it appears that the cells then want to separate as quickly as possible – however, the two cells are attached to each other through the tight ephrin/Eph complex,” explains Klein. So the cells do something else: they extend their own cell membranes so far over the individual complexes that the complex and the surrounding membrane detaches from the neighbouring cell and is fully incorporated into the cell. Left: Ephrin and Eph receptors are found on the surface of almost all cells. Centre: When cells come into contact with each other, the two proteins form a tight complex. This triggers a signalling chain which causes the cell membrane to protrude. This process is controlled by the Tiam and Rac molecules and results in the reformation of the actin cytoskeleton. 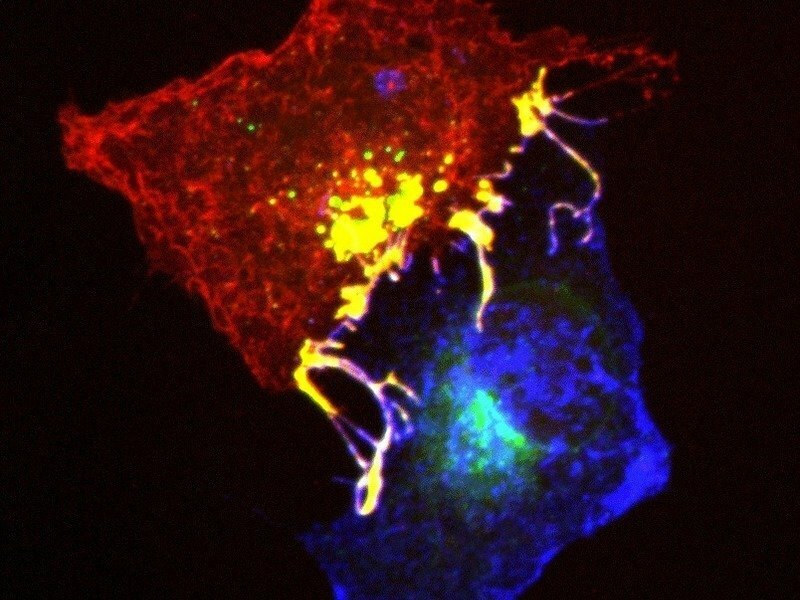 Right: The cells separate when one cell fully engulfs the ephrin/Eph complex through endocytosis. With the help of a series of genetic modifications and the targeted deactivation of individual cell components, the scientists succeeded in demonstrating that Tiam signalling proteins are activated through the formation of the ephrin/Eph complex. As a result, Rac enzymes become active which, in turn, cause the engulfment of the ephrin/Eph complexes by the cell membrane through the local restructuring of the actin cytoskeleton. If one of these components is missing, this engulfing process through endocytosis is blocked and the cells do not repel each other but remain attached. The clarification of this signalling pathway is important, as it provides a better understanding of the development of neuronal networks and other organ systems. The findings are also of considerable interest for cancer research: thanks to their ability to control cell repulsion, ephrin and Eph receptors play a major role in the penetration of tissue by cancer cells and in the formation of metastases. For this reason, receptors and their connection partners are the focus of current medical research. Better understanding of this signalling pathway, through which cell repulsion is controlled, could enable the development of new drugs to combat cancer. 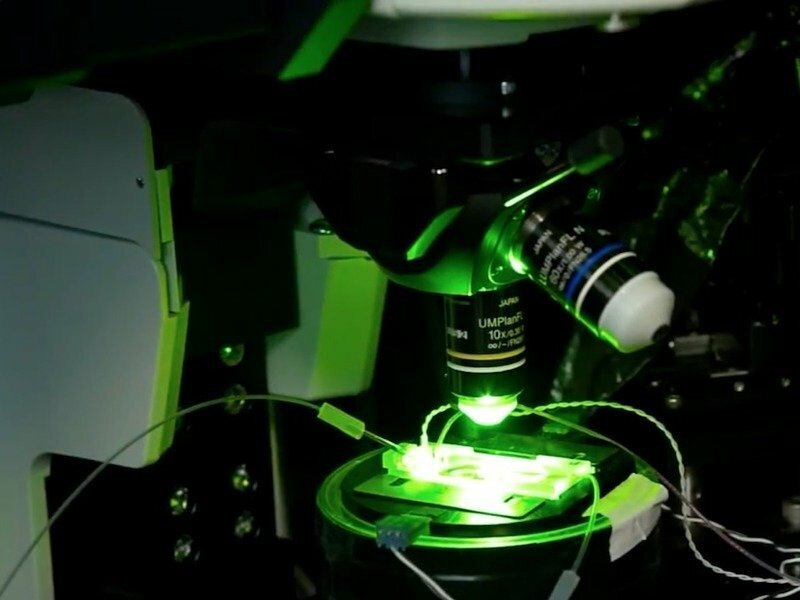 Optogenetics and 2-photon-microscopy enable scientists to ’see’ how synapses are formed in real time. The Kwon Lab at the Max Planck Institute for Neuroscience, Florida, has identified mechanistic and functional elements that govern synapse formation and have established new insights about how synapses are formed in cortical neurons in early postnatal stages. Proper cell-to-cell connection is a fundamental mechanism for normal brain function; abnormal connections result in various forms of brain disorders or death. Synapses are the functional connections between neurons. They are either excitatory or inhibitory depending on the type of influence they initiate. The spatial arrangement of synapses has a critical role in neuronal function, but the rules that govern this precise synaptic localization remain unknown. Max Planck Florida Institute for Neuroscience researchers have now identified mechanistic and functional elements that govern synapse formation and have established new insights about how synapses are formed in cortical neurons in early postnatal stages. The formation of excitatory and inhibitory synapses between neurons during early development gives rise to the neuronal networks that enable sensory and cognitive functions in humans. Inhibitory synapses decrease the likelihood of the firing action potential of a cell, while excitatory synapses increase its likelihood. Remarkably, both excitatory and inhibitory synapses are formed on dendrites of cortical neurons with high temporal and spatial precision, and it is believed that the spatial arrangement of synapses determines the functional consequences of excitation and inhibition of neuronal activities. However, studying the general mechanisms of synapse formation and distribution in dendrites has been challenging due to a lack of reliable methods that trigger and monitor synapse formation. In their August publication in Science, Max Planck Florida researchers Won Chan Oh and Hyung-Bae Kwon describe how they precisely induced and visualized the formation of new synapses in real time in live animals. By using fine-scale optical techniques, they demonstrated that the local release of the inhibitory neurotransmitter, GABA, induces both inhibitory and excitatory synapse formation in the developing mouse cortex. The induction of synapses required signaling through GABAA receptors and voltage-gated calcium channels and the newly formed synaptic structures rapidly gain functions. The scientists optimized a spatiotemporally controlled method that induces and visualizes the formation of inhibitory and excitatory synapses in cortical neurons in vitro and in vivo. According to Oh, these findings suggest a model in which GABA is the common molecule that sets the balance between inhibitory and excitatory synaptic contacts in early postnatal stages. “Given that abnormal synapse formation causes various neurodevelopmental diseases such as autism spectrum disorders and epilepsy, understanding activity-dependent mechanisms of initial synapse formation will be important for developing new therapeutic strategies for these conditions,” explained Kwon.